1. Let us know name of Nissan parts accurately as much as possible. Even if you don’t know about it, please don’t worry. Let us know about approximate position, shape and function, etc. We will send diagrams later on. 3. Nissan Parts-numbers are not mentioned on the part itself normally. 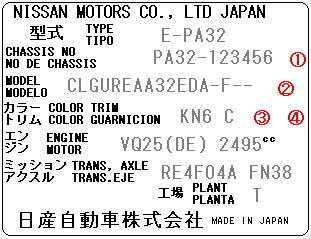 A number on the part itself is sometimes the same as a parts-number, but most of numbers on the Nissan parts themselves make us confused. 4. Rough description of a Nissan part sometimes makes us confused so much. For example, a description like front suspension. We can’t understand if it’s a front suspension arm or a front shockabsorber. STEP III > Send inquiries to our office by e-mail/form. 3. Send inquires using this form.